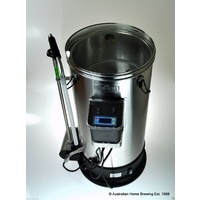 Mangrove Jacks Grainfather all in one Mash Brewing System 30L.. 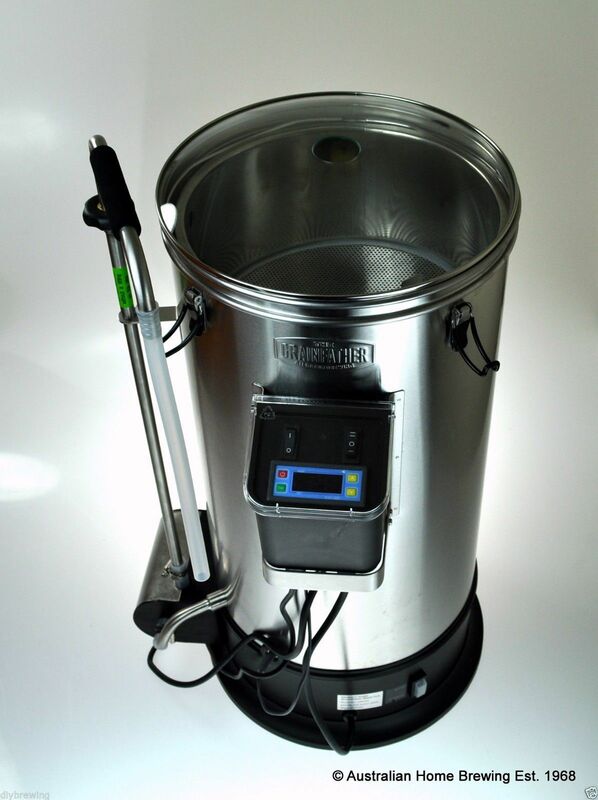 This is the latest model Grainfather that runs manually. 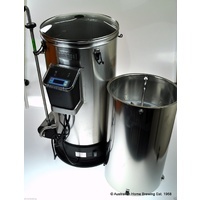 To order the blue tooth version see our other Listing for "Grainfather Connect." Do you want to mash? Do you want to make great beer from grains? 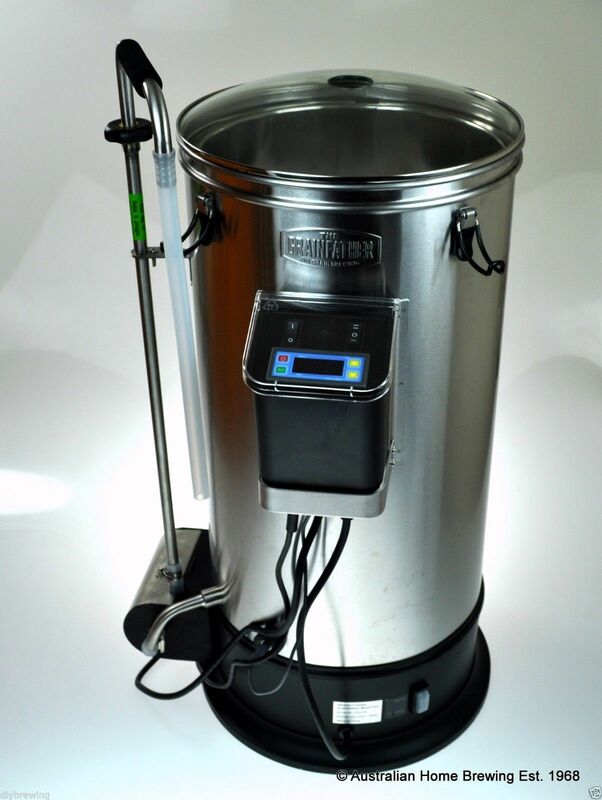 Solution: the all in one system known as the Grainfather. 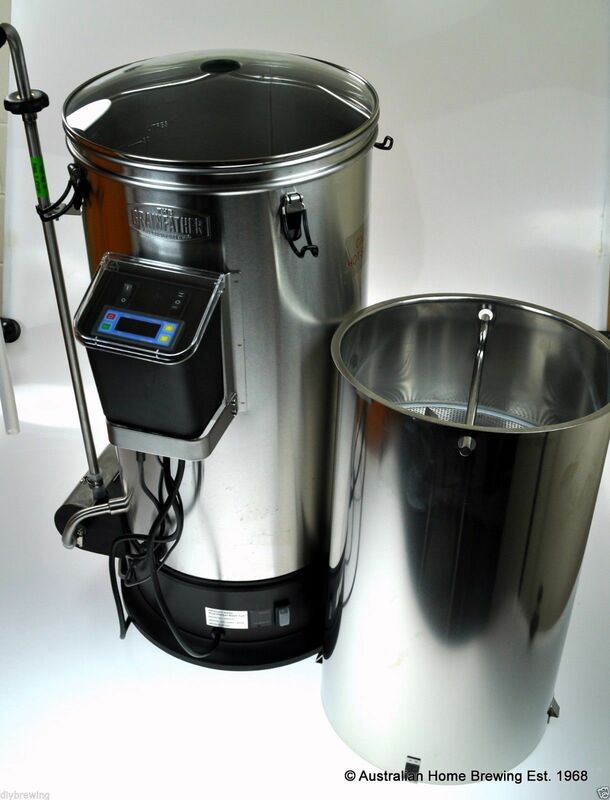 The Grainfather system makes the mashing process very easy and will suit both experienced and novice mash brewers alike. 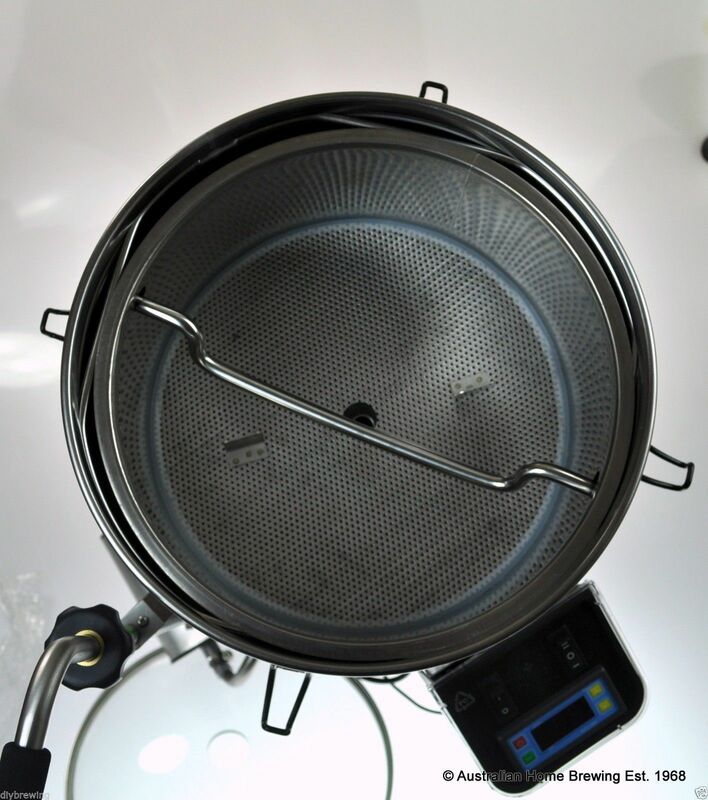 It is made from high grade Stainless steel and includes a built in pump, mesh filter baskets, internal 2000W electrical heating element, and the ability to control temperature at exacting levels. It also includes a separate internal copper coil wort chiller unit. The Grainfather has a 30L capacity for small batch mash brewing. Easy to follow and comprehensive instructions included…… For more info please read on. 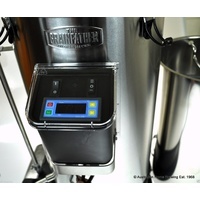 The Grainfather is known as the all in one brewing system for mash brewing. The unit is designed in New Zealand and constructed with high grade stainless steel and quality parts which are all replaceable. It has a 30 litre capacity to make approximately 23 litres per batch. 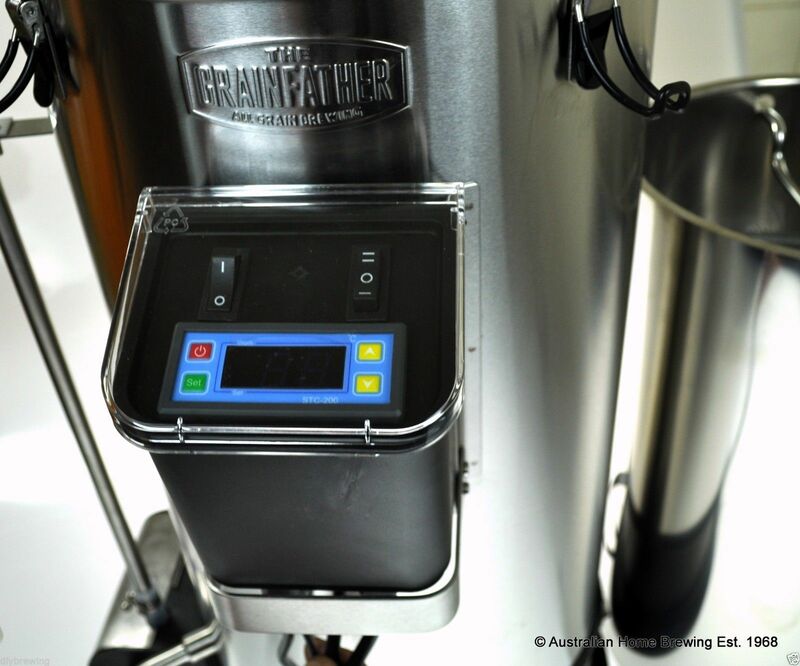 The Grainfather is powered by electricity and designed for use indoors. 3. Set the Mashing Temperature on the control panel. 5. Install Top Perforated Plate on top of the basket so it sits on top of the grain bed enclosing your grains. 7. Turn on the pump and wort will star to flow throw the re circulation pipe. 1. 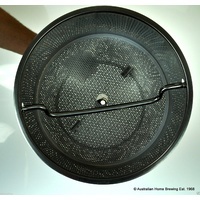 Once mashing is complete removed tempered glass lid and lift the basked up using the supplied handle. Turn 90 degrees to lock into place above the wort allowing the mash liquid to fully drain into the boiler. 2. Pour the required amount of prepared sparge water over the grain into the boiler below. Then remove the basket and discard the used grain. 1. Now it is time to set the controller to boil. As the wort begins boiling proteins foam up. Stir gently for 5 to 10 minutes until foaming stops. 2. Add hops as per your recipe boil times which are usually a total of 60-90 minutes. 1. When boiling is complete put the tempered glass back on the boiler and connect the coiled wort hose. Turn on the pump to recirculate the wort back through the boiler and continue for 5 minutes. 2. Now it is time to run tap water through the chiller which runs through a separate compartment to the wort in the coil. This tap water drains as hot which causes the wort to cool quickly and once the Tap water becomes cool switch the pump off. 3. 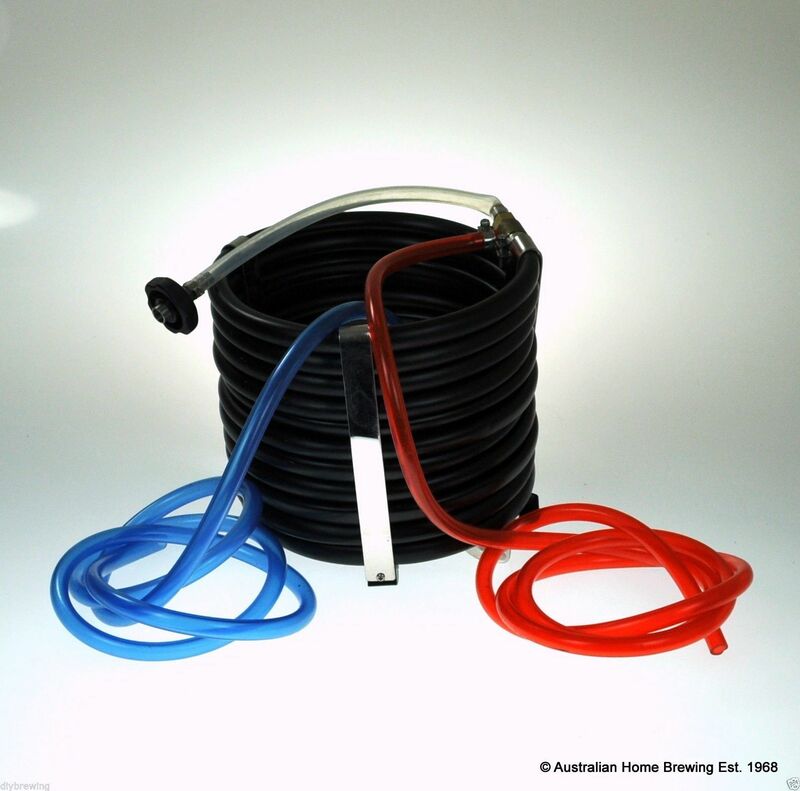 Pump the wort into your clean and sanitised fermenter. 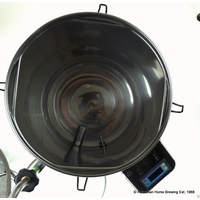 Take your Specific gravity reading as per normal and ferment away. The job of the Grainfather is done. The digital temperature control unit allows you to select any temperature required for any recipe. This means you can do a simple manual step mash. It also provides the options for mash and boil. Simply dial in the temperature you require then switch the pump on. What it also means is that you can do your step changes for your mash. 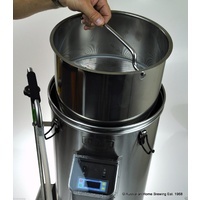 Simply adjust the temperature at various points throughout the mashing process as your brewing recipe requires. It also features a flick switch at the bottom to allow the running of a 2000 watt element or switch down to a 500watt element. 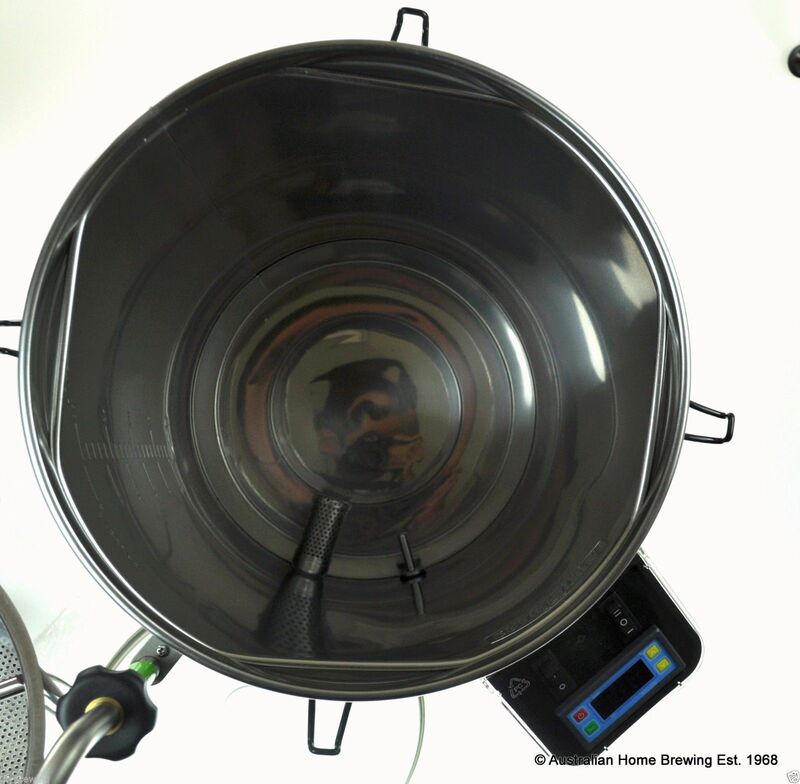 Use 2000watt to very quickly get to the temperatures you desire and switch it down to 500watt during the mashing for a very consistent even temperature. The magnetic drive pump ensures there is a continuous flow of wort through the grain bed during mashing. This maximises malt-sugar extraction and improves efficiency. The pump is also used during the cooling process cooling your wort through the counter flow wort chiller. The pump is designed for longevity and powerful enough to be able to cope with the pressures of pumping the wort all the way circulating it over the grain bed. This unique telescopic pipework design with the unit allows you to adjust the height of the mash plates which allows you to control the ratio of grain to water and keeps a consistent temperature throughout your grain bed. This also makes it possible to do a wide range of grain bill sizes from low to high gravity beers. You can do up to a 9kg grain bill in the Grainfather. 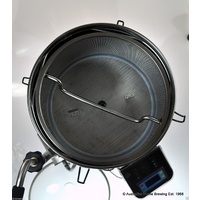 The Grainfather comes with a tempered glass lid for gradual heating efficiency before and during the mashing stage and allows you to view the mash in action . 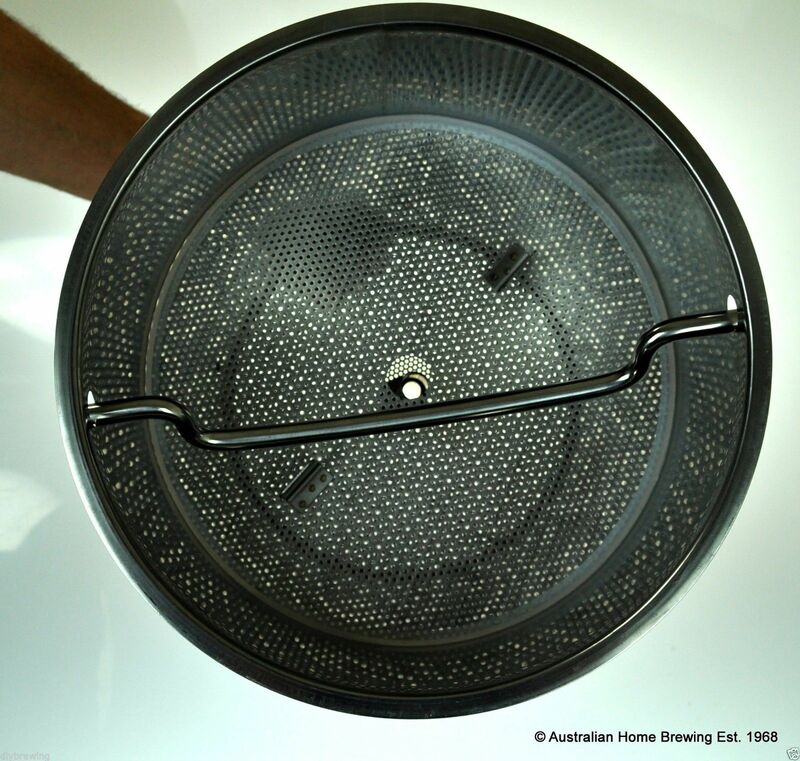 The mashing basket has a perforated plate both top and bottom to separate the grains during the mashing. Once mashing is complete the whole basket lifts up turns 90 degrees and locks into place above the main tank to secure it for sparging. 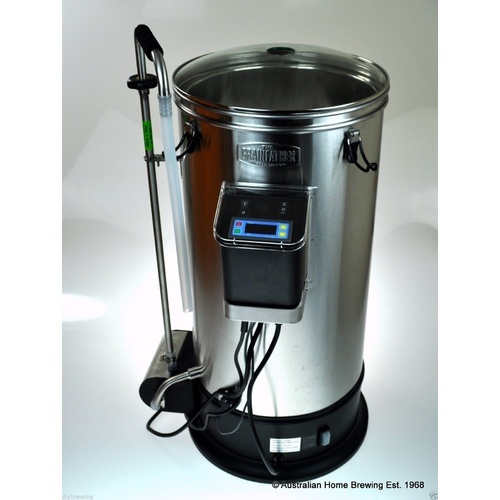 Once you have sparged into your Grainfather you can the switch it to boil your hop additions. When complete it is time to get out the counter flow wort chiller. It can sit neatly on top and connect straight into your pump which you can switch on manually using the control panel. This pumps the wort straight out into your fermenter. 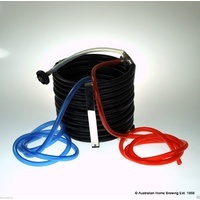 The counter flow chiller cools your wort as you are pumping it into your fermenter. Hot water goes one way while cold water goes the other allowing instant cooling straight into your fermenter at 20 degrees. There is no need for ice or a copper cooling coil. 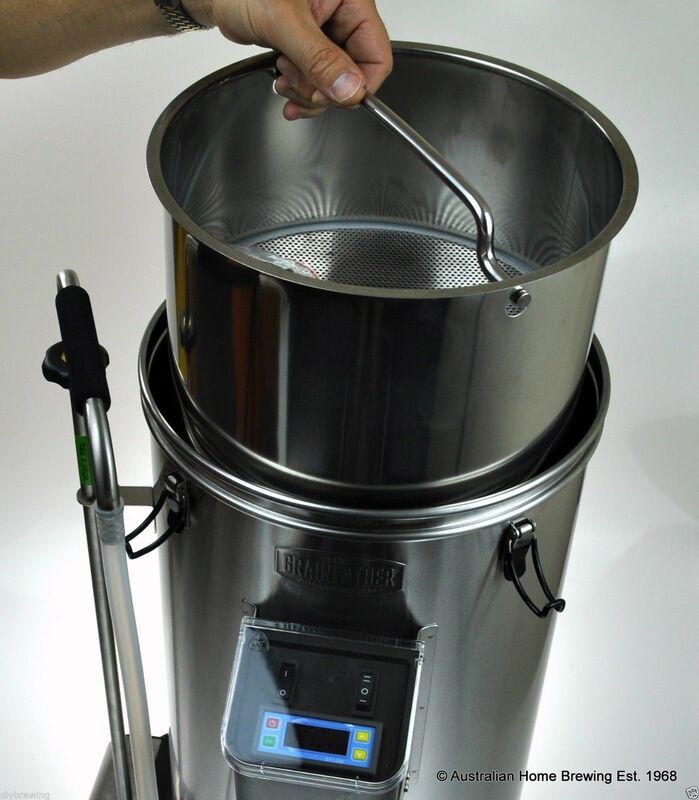 All the parts on the Grainfather are adjustable and easy to assemble so it is easy to clean and simple to replace parts if needed.